A few weeks ago we looked at Jesus’s final instructions as found in each of the Bible’s four biographies of him. Melding these together, we came up with three steps. First is to follow Jesus, second is to wait for Holy Spirit power, and three is to go and tell others. Looking specifically at Matthews record of Jesus’s words in Matthew 28:19-20, we have the passage many people call the Great Commission. In this we have four action verbs. Jesus tells his disciples they are to go. This is the opposite of stay. But staying is exactly what they do. They stay in Jerusalem—as initially commanded—waiting for the Holy Spirit. But once the Holy Spirit shows up, they continue to stay. It isn’t until a wave of persecution sweeps through the church in Jerusalem that Jesus’s followers scatter. Finally, this forces them to go, as Jesus instructed. From these four locations we can interpret four areas of ministry. Jerusalem, which is where we live; Judea, which is our own people group; Samaria represents other people who live nearby; and the ends of the earth mean everyone else. As Jesus’s followers go on their missionary journeys, they are to make disciples. He doesn’t say to make converts, though the implied prerequisite for discipleship is following Jesus. Instead he says to make disciples. Conversion is a onetime effort. We make the decision to follow Jesus in an instant, but discipleship takes a lifetime. Too often the focus today is getting people to say “yes” to Jesus. Evangelists track their number of salvation decisions, but they seldom talk about the difficult follow-up work of making disciples. In fact, they often convert people and then leave, with no discipleship work whatsoever—abandoning their converts and letting them flounder. For our third action word we read baptize. This is phase one of making disciples. Notice that baptism doesn’t come before the instruction to make disciples, but after it. It’s the first aspect of making disciples, not a prerequisite for discipleship. Some people, however, place baptism ahead of discipleship, often stopping at baptism and never making any effort to disciple the people they baptize. This brings us to the fourth word in the Great Commission. The fourth action step in the Great Commission is to teach. Like the word baptize, teach is part of making disciples. It’s phase two of the discipleship process. And though baptism is a onetime action, teaching is ongoing. Teaching is the long-term effort of making disciples. There are other aspects of teaching, which Jesus doesn’t detail in this passage, but we can infer from his actions we read about in the Bible. After teaching comes application, in which the disciples go out and do the things they learned about. We see this when Jesus’s disciples baptize others (John 4:1-2), heal others (Matthew 10:1, Mark 6:7), and point others to Jesus (Luke 10:1). In these last two instances, they must go. This takes us full circle, implying that the final step of discipleship is to go and repeat the process. 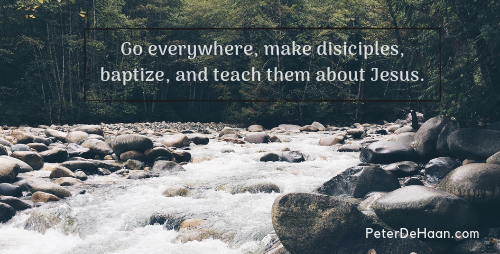 From Jesus’s charge in the Great Commission, he wants his followers to go everywhere, make disciples, baptize, and teach them. Then and now…the best place to go to make disciples of all nations would be Jerusalem…the city of PEACE. Although that would be reading the Scripture factually rather than reading it in the language of salvation. Jesus is with them and they need to realize it from generation to generation so that there are disciples. Another thing they are to do is to baptize them…initiate them…tell them the name of the Father and the Son and the Holy Spirit. Teachers today would be better equipped with realizing and baptizing themselves and the next generation sharing Marks Gospel 15:21. This verse is a foundation stone that gets rejected. Perhaps it lost favour during the Protestant Reformation because of Simony and the selling of Indulgences. Exegetes and Biblical scholars insist there were many Simons instead of one whom Jesus and the Red Haired One (Rufus) called Peter and Father. Linda, I like that you connect those two passages together using the word “therefore” to link them. Excellent observation!